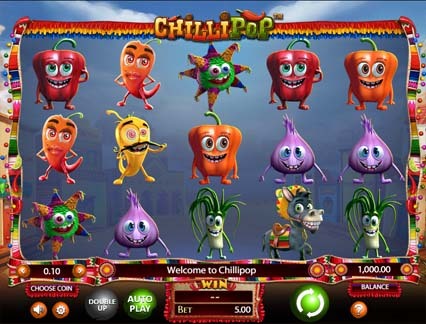 Game Information: Released in November 2018, the Chilli Pop is a cascading pokie game from Betsoft software developer. From the Mirachi soundtrack to the potent red and green Chilli symbols, Chilli Pop is saturated with the sizzle and spirit if Mexican Cuisine. The game features 5x3 reels layout and will form winning combos through clusters rather than regular ways to win or lines. The game has wilds and stacked multipliers and free spins with even bigger winning areas of 8x8 reels. This is a game that pays often, though not necessarily on a single spin. Betsoft is taking you south of the Rio Grande where you can assemble all the salsa by making use of all the ingredients in offer. As mentioned, the game benefits form cluster pays and offers gamers with free spins. Symbols include the Mule which represents the Scatter, the Pinata which is the game’s Wild symbol. Other symbols include the red and yellow chilli peppers, bell peppers (orange, green and red), onions, leeks and tomatoes. The vegetable symbols are presented as cute, smiling or moving characters on the reels offering an interesting view. The Mule is a likable character and is presented wearing a Sombrero and always smiling. The Mule is the Scatter and triggers the Free Spins Feature. If you get three or more scatters anywhere on the reels, you will be awarded five to 26 free spins. You can get a bigger game are of as much as 8×8 by getting extra mules during the Free Spins Feature. Pinata is the Wild and substitutes all regular symbols and if you get to fill all reels with it, you will be rewarded with a certain Bonus Prize. Wilds can add multipliers with the highest payout going up to 1,000x the bet or $ 50, 000. The maximum wager for this pokie is 50 coins which allows you the option of picking a denomination for them. The bet value ranges from $0.01 to $ 1 making the maximum wager amount to be between $0.50 and $50. You can opt for the Buy Feature which means that you will have to spend 49x the usual bet. Clusters are formed by landing three or more matching symbols with each symbol having an attached prize. The best prize is 12x the stake per symbol before multipliers are applied. You can use the Double Up Feature to double your win. After winning, you can risk what you have earned by pressing the Double Up button. During this, you bet 50% of your winnings and will win based on the toss of a coin. You can use this feature for as many times as you like. All ingredients required to make perfect salsa can be found among the regular symbols. The female Orange Pepper and the Male Yellow Peppers form the leading pack of vegetables gathering for the fiesta. You will also encounter the Onions, Garlic, tomatoes and Paprika. When it comes to graphics, BetSoft will always impress its players. The Chilli Pop reels feature the craziest food animations you will ever come across. They have comic facial expressions and slightly suggestive of the minions. There is a charming village on both sides of the reel set, and the reels themselves are bordered with vibrant decorations. To add to the game’s excitement, there is a lively Mexican tune playing in the background. Ultimately, there is nothing that you can find at fault when considering the sound and graphics of Chilli Pop. 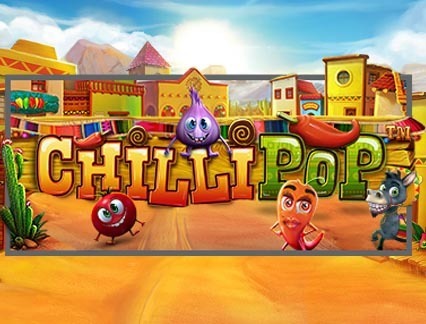 Chilli Pop is a medium volatile game with an RTP of 95.38% but the hit rate is quite impressive. While this is a medium volatile game, you still can expect the biggest wins from the free spins round. The maximum amount you can win from Chilli Pop is $ 103, 363. While this is not quite an incredible amount it is not bad either considering the low wagering limits. 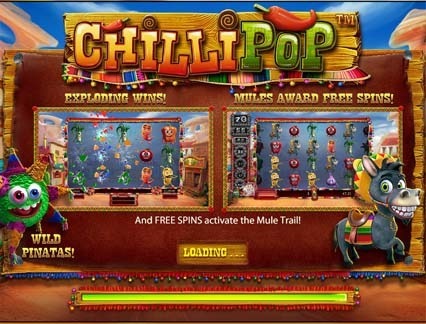 Chilli Pop has a Free Spins Feature that is triggered by landing three or more Mules. When you land 3 to 15 mule Scatters, you get from 5 to 26 free spins. During the Free Spins, spinners will start collecting Mules to increase the reel grid to as much as 8×8. Be on the lookout for the Mule Trail to the left of the screen to follow your progress. Pinata Wild substitutes for all symbols and also boosts the multiplier b 1x on each wild landed on the reels. If you fill out all the cells with Pinatas, you will land a bonus win. Another feature to look out for is the Double Up feature where you can double your win by playing the pokie.